Last weekend northeast Ohio had a respite from Arctic temps and gray days. And with it came the desire to get outdoors for a wild ramble. This part of the state has several state parks within a 20 mile radius. My granddaughter, Arianna and I were looking for something a bit different from a regular walk in the woods. 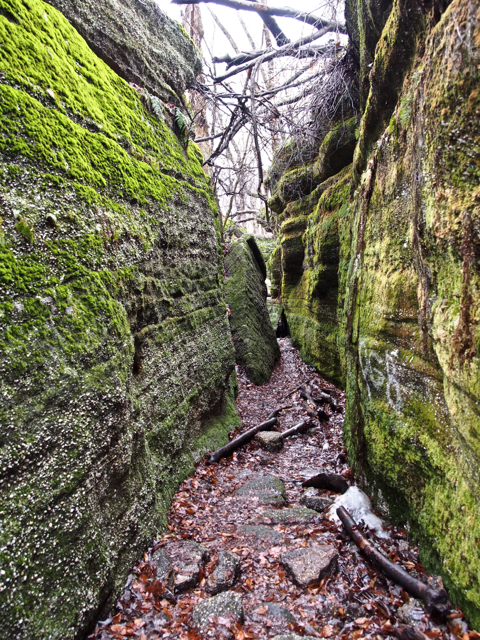 We found an awesome place at Ledges State Park and spent two and a half hours hiking up and down, over and through hundreds of ledges, ravines and caves that make up this unique area. Getting outdoors, having an adventure and making memories……. Annie, this reminds me of a place called The Rock Garden in Loyalsock S.P. in north central PA. 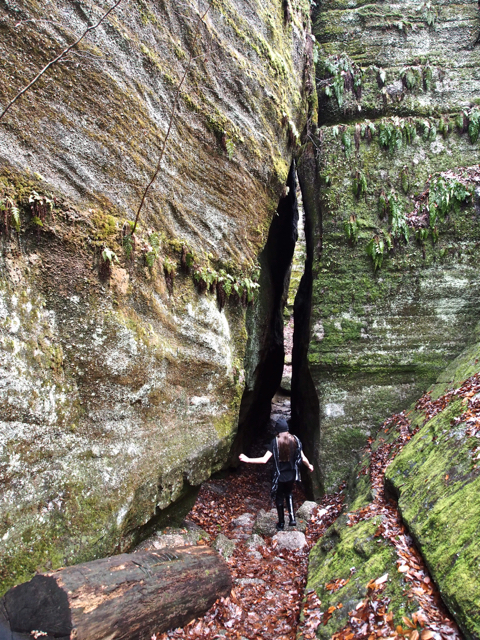 I spent a day last summer crawling over and through the same type of crevices. 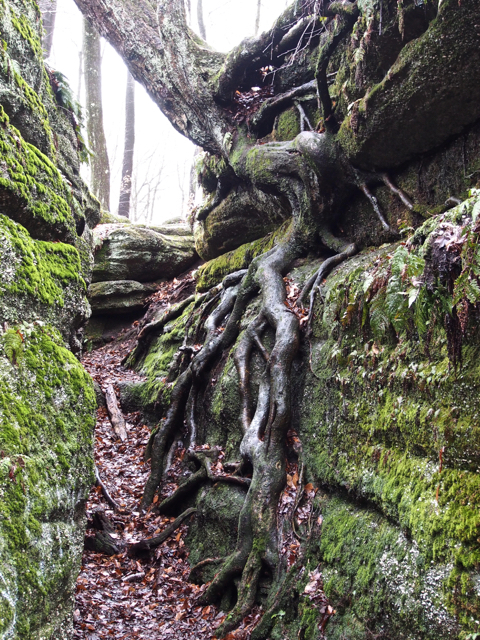 I love the tree roots, mosses, and ferns that adorn the rock faces. Great pictures. Miss you! I have not been there, Alice. But I have been to the Rock Garden at World’s End S.P. It is awesome. Thank you and Miss you too. Love the pictures. 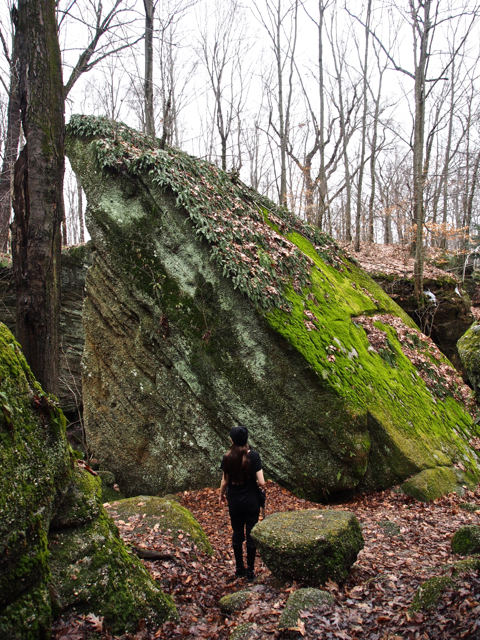 I am always amazed how the trees sit on top of huge boulders and still manage to get their roots down to find soil. What a fantastic place. Wish I had been hiking with you. The memories you will always have of the wonderful day with Arianna will last a life time. Such fun! Thank you, Sher! PA has some great state parks with similar settings. We will have to go next time. Wonderful place – that is the kind of nature I love. Me and Totti would have enjoyed it immensely hiking with you! We would welcome you with open arms. Let us know if you ever travel to the U.S. I will be in touch if I ever plan to go. At the moment it is not possible.